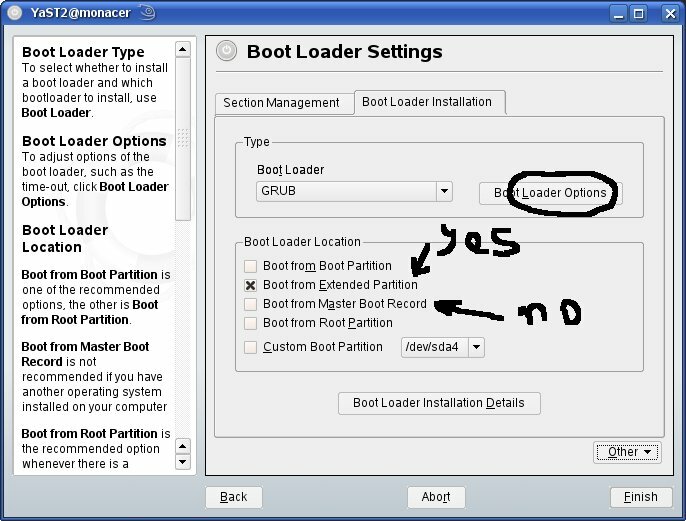 This article explains what are the preferred options to setup with YaST and the default GRUB bootloader. You are installing openSUSE and this openSUSE will not be the only Operating System on the disk(s). YaST offers many options and you don't know which one is the best. In fact the options given here are not the usually known on Linux. There are very good reasons to choose them, mostly explained on Bugs/grub (old article). NOTE: this was not tested on multi-disk installation, but only with one disk with several partitions. The procedure shown here was created on a running openSUSE 10.3, there may be slight differences at install time. 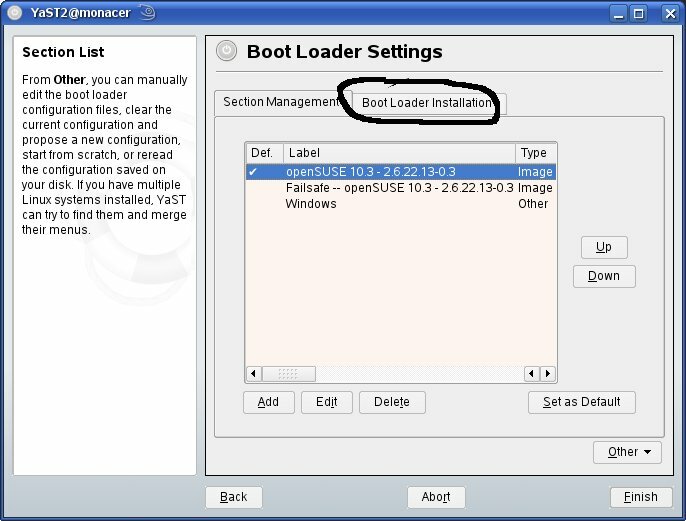 At some time you will go to the bootloader screen. If necessary go to expert mode. On the right (in the circle) you see "Bootloader installation". Go there. Usually one will choose "MBR". Don't! It's no more the preferred one. 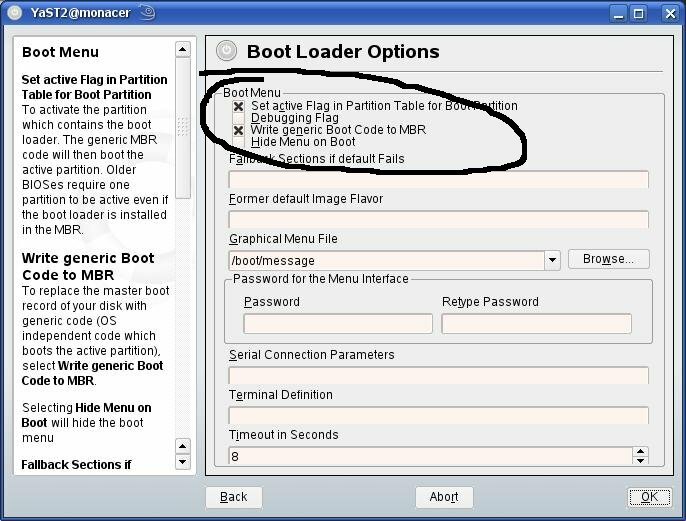 In fact a "default" MBR tries always to load the primary partition indicated as bootable by a flag, so the best practice is to use this feature. YaST will take care of this for you. But you must first choose any primary partition to hold GRUB "stage1" most important part. Of course this can't be the Windows partition, but any primary belonging to Linux is good (that is root, or any other, including the extended fake partition, as shown on the image. To know what partitions are good. Only the numbers 1, 2, 3 or 4 are usable. The bootable one is flagged by an "*". Of course activate these two options. That's all. Save. Try to reboot (just in case, keep an openSUSE CD/DVD at hand to be able to start the installed system in emergency). With this setup, even Windows can setup your booting menu if it ever disappears, like for example if you need to re-install Windows. This page was last modified on 14 November 2012, at 21:02. This page has been accessed 24,299 times.